However, while comprehensive tax reform may be on hold for a few years, reform of business taxes—the corporate income tax—is still being considered by the Obama administration and many in Congress. The contentious aspects of reforming the corporate income tax include even such basic issues as how to tax the profits of multinational corporations (MNCs). Some argue that the United States should adopt a territorial approach to taxing U.S. multinational corporations—that is, not taxing the profits they earn from overseas operation (or, in the jargon, their active foreign-source income). Others argue that the U.S. should move to a pure worldwide system in which active foreign-source income is taxed at U.S. rates as it is earned. The current U.S. system is between these two approaches: Active income of foreign subsidiaries of U.S. parent multinational corporations is taxed only when it is repatriated or paid to the U.S. parent corporation as a dividend. Not imposing taxes on income held abroad is known as deferral in that taxes are deferred until the income is repatriated. Rules to protect the U.S. corporate income tax base (that is, to ensure that corporate earnings are indeed subject to taxation), known as subpart F, have been weakened over the past several years by legislative and rule changes, shrinking the corporate income tax base and reducing revenue raised from corporate taxes. About 60 percent of multinational corporations’ foreign-source earnings and profits come from countries in which the firms have little business activity, evidence that these MNCs are using tax havens to avoid paying the U.S. corporate income tax. Fixing the problem of corporate income taxation does not require deeply complex reform that touches on every part of the tax code; instead it largely can be achieved simply by ending deferral. Ending deferral would move the U.S. closer to a pure worldwide system and could significantly increase corporate tax revenue, reduce profit shifting, increase investment in the U.S. by American multinational companies, and simplify the corporate income tax system. Ending deferral could increase corporate tax revenue by over $50 billion per year, or $500 billion over 10 years. The additional revenue could be used for education funding, infrastructure improvements, and other investments in America’s future. A multinational corporation (MNC) is a business that is incorporated and operates in one country (the home country) but also maintains operations in other countries. There are two basic approaches to how the home country taxes the income of a multinational corporation: the worldwide approach and the territorial approach. Under the worldwide approach, the home country would tax the worldwide income of the MNC, regardless of where the income is earned.1 That is, both domestically earned and foreign-source income is taxed by the home country. Under this approach, the home country generally allows a credit or deduction for foreign taxes paid on foreign-source income to avoid double taxation. The worldwide approach results in capital export neutrality—that is, income from capital owned by home-country citizens faces the same tax burden regardless of where the capital is invested. Consequently, home-country multinational corporations would allocate their capital around the world based on economic considerations and not tax considerations. If all nations adopted a worldwide system, it would promote international efficiency in the allocation of capital. Under the territorial approach, the home country only taxes the income earned within its borders; an MNC’s foreign-source income is not taxed by the home country. Of course, the foreign-source earnings may be subject to taxation by foreign countries. The territorial approach results in capital import neutrality—income from investments by all firms (domestic and foreign) in the same country is taxed at the same rate. It is often argued that U.S. firms are at a competitive disadvantage when operating in lower-tax foreign countries because the U.S. worldwide approach in theory subjects foreign earnings of U.S. MNCs to the higher U.S. tax. The argument of competitive disadvantage, however, is, at best, debatable (Shoup 1974), and, more likely, highly questionable (Gravelle 2012a and 2012b).2 Furthermore, Gravelle (1994) notes that capital import neutrality is not really neutral in that the location of investment could be affected if different countries have different tax rates on capital income—in other words, investment decisions will continue to be based, at least in part, on tax considerations. Different countries take different approaches to taxing MNCs. But none of the major developed countries has adopted a pure worldwide or a pure territorial system. Most countries have a hybrid tax system that falls somewhere between the two approaches. Since the enactment of the Revenue Act of 1913, U.S. multinational corporations have been subject to a tax on their worldwide income. For U.S. corporations with foreign subsidiaries (known as controlled foreign corporations, or CFCs),3 the foreign-sourced active income of the subsidiary is not taxed until it is repatriated through dividend distributions to the U.S. parent company; this is known as deferral.4 Taxpayers, however, have been allowed a credit (since 1918 and a deduction before that) for foreign taxes paid on their foreign-sourced income to avoid double taxation—the foreign tax credit. Deferral and the foreign tax credit complicate the tax system and affect the amount of tax actually collected. Firms benefit from deferral to the extent that the foreign tax rate is lower than the U.S. corporate tax rate. In response to the growing number of incorporations in tax havens (countries with low or no corporate tax) to obtain a tax advantage, the Kennedy administration proposed to eliminate deferral except for income earned in less developed countries that are not tax havens.5 Congress ultimately adopted the administration’s recommendation to end tax haven abuses with the addition of subpart F to the Internal Revenue Code, but did not end deferral in general. Subpart F prohibits MNCs from deferring taxes on certain income known as “subpart F income.” Subpart F income is generally income from passive investments rather than income earned from active business operations. Subpart F income is highly mobile income that easily can be shifted to low-tax jurisdictions; it is taxed as it is earned regardless of whether it is repatriated or not. The general trend, however, has been the weakening of subpart F with “check the box” and the enactment of the “look-through rule” (see the text box for more information).6 Sicular (2007, 349) notes that the look-through rule “effectively repealed antideferral rules for much of what subpart F of the Internal Revenue Code was originally intended to prevent.” The look-through rule expired at the end of 2013, but is part of the “tax extenders” package that Congress is considering.7 While it is likely to be extended, even if it isn’t, most of its adverse tax effects can be achieved through check-the-box regulations. Rather than shift investments to tax havens to take advantage of low taxes, firms find that the tax advantages can be achieved at lower cost by simply shifting profits to the tax havens. Indeed, over the past 20 years, rules from both the executive and legislative branches reducing the effectiveness of the antideferral rules of subpart F have increased offshore profit-shifting. The Treasury Department issued the check-the-box regulations in 1997, and Congress enacted the look-through rule as a temporary measure in 2006. Income from many transactions between two foreign subsidiaries (CFCs) of the same U.S. parent is considered subpart F income and taxed by the United States. The check-the-box regulations were intended to simplify tax rules related to the classification of subsidiaries for tax purposes. The regulations essentially allow MNCs to transform a foreign subsidiary into a hybrid entity—a CFC that is recognized as a corporation in one tax jurisdiction (and taxed accordingly) but not in another tax jurisdiction. For example, suppose a U.S. parent corporation has one subsidiary in a low-tax country (CFC-low) and one in a high-tax country (CFC-high). If CFC-low extends a loan to CFC-high, then the interest paid by CFC-high to CFC-low would be considered passive or subpart F income of the U.S. parent and taxed by the U.S. (The interest payment would be a deductible expense by CFC-high in determining its tax liability in the high-tax country.) Under the check-the-box regulations, the U.S. parent can elect to have CFC-high considered as a disregarded entity (DRE) by literally checking a series of boxes on IRS form 8832. In other words, CFC-high is now considered a branch of CFC-low for U.S. tax purposes—the two CFCs are considered a single entity and, thus, there is no interest payment subject to tax from the perspective of the IRS. The look-through rule, enacted in 2006 as part of the Tax Increase Prevention and Reconciliation Act, provides “look-through” treatment for certain payments between related CFCs; in essence removing certain passive income from subpart F and permitting much of what the check-the-box regulations allow. Deferral provides an incentive to multinational corporations to keep foreign-sourced active income offshore because corporate taxes are not due until the income is repatriated. Furthermore, deferral also provides an incentive to shift income to low-tax jurisdictions and to keep it there. This is referred to as the “lock-out effect.” One method often used to shift profits from relatively high-tax countries (such as the United States) to low- or no-tax countries (tax havens) is transfer pricing—the pricing of intellectual property rights and other intangible assets when transferred from the U.S. parent company to an offshore affiliate. The problem with this is that a multinational’s “profits may be artificially inflated in low-tax countries and depressed in high-taxed countries through aggressive transfer pricing that does not reflect an arms-length result from a related-party transaction” (JCT 2010, 5). The deferral of tax on active foreign-source income results in lower corporate income tax revenue. As a matter of fact, it is listed as the largest corporate tax expenditure by the Joint Committee on Taxation (JCT 2013).8 JCT estimates that deferral will reduce corporate income tax revenue by $265.7 billion between 2013 and 2017—over $50 billion per year on average. Although the United States does tax the worldwide income (domestic and foreign-source) of U.S. nationals (individuals and corporations), it takes into consideration the fact that the country where the income is earned may also tax that income. To prevent double taxation of income, the U.S. allows a credit for foreign taxes paid. But to protect the tax base, the U.S. limits the amount of the foreign tax credit to what the taxpayer’s tax liability on the foreign-source income would be under the U.S. tax code. Since 2004, businesses have calculated their foreign tax credit separately for two different “baskets” of income—passive income and general income (mostly active income).9 Within each basket, excess credits generated in high-tax countries (that is, potential credits that could not be used because the foreign tax liability is higher than what would be owed under the U.S. tax code) can be used to offset U.S. taxes due on income earned in low-tax countries. Excess credits can effectively offset much or even all of the U.S. tax liability on income repatriated from tax havens. This is known as cross-crediting and has become more extensive over time as the foreign tax credit rules have changed in favor of multinational corporations. Before 1976, cross-crediting was limited because the foreign tax credit was calculated separately for each country—known as the per-country limit. After 1976, the per-country country limit was abandoned and separate limits for different categories of income were adopted. There were nine categories or baskets of income until 2007 and only two baskets after 2007, thus making cross-crediting easier. 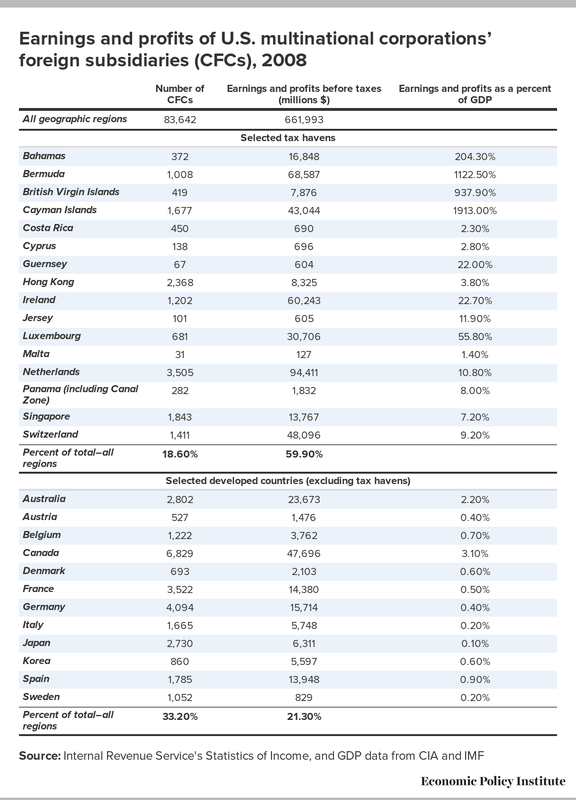 CFCs in the selected tax haven countries account for about 19 percent of the total number of CFCs (see column 1), but account for 60 percent of all CFC before-tax earnings and profits (see column 2). Compare this to 12 large countries with significant U.S. MNC presence—this group accounts for one-third of all CFCs but less than a quarter of total earnings and profits. It is important to keep in mind that the tax haven countries are not large economic powerhouses; the combined GDP of the 16 tax haven countries listed in the table is less than Italy’s GDP. The last column of the table reports, for each country, the CFCs’ earnings and profits as a percentage of the country’s GDP. For tax havens, profits from CFCs are often very large compared with the country’s GDP. In four cases it is many times larger than GDP—from two times to nearly 20 times as high. It is difficult to imagine that these profits are due to economic activities actually undertaken in these specific countries. In the large developed countries we examine, CFC earnings and profits tend to be very small compared with the country’s GDP. Costa and Gravelle (2010) find that U.S. business income in low-tax countries is high relative to actual business activity (e.g., employment and physical assets) in these countries. Grubert (2012) shows that a large gap between the U.S. tax rate and foreign tax rate leads to an increase in the share of income in that country but not an increase in sales in that country. This research combined with the information in Table 1 provides ample evidence of rather aggressive profit shifting by multinational corporations. How much money is “trapped” overseas? It has been widely reported that U.S. multinationals claim an estimated $2 trillion “permanently” reinvested offshore income—in essence, income locked out of the United States and hence unlikely to ever be subject to the U.S. corporate income tax. Yet many CEOs have argued that these funds could well return if another repatriation “holiday” allows these funds to return to the U.S. and face a more “reasonable” tax rate of, say, 5.25 percent or even lower (compared with the normal 35 percent tax rate).12 This is not a vain hope on the part of these CEOs; there was indeed such a repatriation holiday in 2004. To boost the case for offering a repatriation holiday, many CEOs (and some policymakers) argue that the repatriated funds will lead to increased investment and create jobs in the United States as well as increase corporate tax revenue. There is, however, some disagreement over how much is actually permanently reinvested overseas. Zion, Varshney, and Burnap (2011) estimated that S&P 500 companies had almost $1.3 trillion in undistributed foreign earnings in 2010—double the amount in 2006. A May 2012 study by J.P Morgan analysts found that multinational corporations have over $1.7 trillion in undistributed foreign earnings (Chasan 2012). A more recent study reportedly estimates that $1.95 trillion is indefinitely invested overseas (Murphy 2013). Although it is indefinitely invested overseas, a large chunk is reportedly sitting in U.S. bank accounts or in U.S. Treasury securities (Linebaugh 2013). In other words, much of these permanently reinvested overseas earnings are actually invested in U.S. liquid assets rather than in foreign physical assets. Furthermore, many observers argue that U.S. multinationals are able to tap their overseas earnings without paying U.S. tax (Drucker 2010). Some policy analysts and policymakers, such as House Ways and Means chairman Dave Camp, have advocated that the U.S. adopt a mostly territorial tax system. The Camp plan would allow multinational corporations to deduct 95 percent of repatriated foreign-source CFC active income from taxable income.19 With a 25 percent statutory corporate tax rate, this foreign-source income would be taxed by the U.S. at a 1.25 percent tax rate (with no foreign tax credit). Subpart F income would continue to be taxed at the statutory tax rate as it is earned. A territorial system, however, does not address the problems of the current international business tax system. As a matter of fact, this system would probably exacerbate the problems. Not taxing foreign-source active business income strengthens the incentive for U.S. multinationals to shift profits overseas and claim that this income is permanently reinvested overseas. Furthermore, passive (and hence readily mobile) income will continue to be taxed as it is earned under the Camp plan. To protect the tax base, the Camp proposal attempts to strengthen subpart F. The foreign tax credit is also retained to prevent the double taxation of subpart F income. Consequently, two major rules contributing to the complexity of the tax system would remain in the tax code, which all but guarantees continued full employment for tax lawyers. And if the IRS’s budget continues to be reduced, then the tax base will be further eroded as tax lawyers find more and more tax loopholes with no IRS push back. Sen. Max Baucus, chairman of the Senate Finance Committee before he was chosen to be the ambassador to China, released a staff discussion draft for international business tax reform.21 The discussion draft contains two options for taxing the foreign-source income of multinational corporations—they are dubbed “Option Y” and “Option Z.” Both options are hybrid systems (that is, between a territorial system and worldwide system). The options would expand subpart F to include more income as subpart F income to prevent profit shifting. Additionally, the options would repeal check-the-box and look-through rules. Option Y moves toward a partial territorial system. The foreign-source income of CFCs is divided into two categories. One is foreign income earned from selling products and services to U.S. customers; this income would be taxed as it is earned at the full U.S. corporate tax rate.22 The other category is foreign income earned from selling products and services in foreign markets. If this income is subject to an effective foreign tax rate that is at least 80 percent of the U.S. corporate tax rate, then the income is exempt from U.S. taxes when repatriated. If the effective foreign tax rate is less than 80 percent of the U.S. rate, then the income is considered subpart F income and taxed currently with a deduction for 20 percent of the deemed dividend and a foreign tax credit. Essentially, all foreign income is subject to a tax rate that is at least 80 percent of the U.S. tax rate (though not necessarily taxed by the U.S.). Option Z, as with Option Y, would have the same two categories of foreign-source income, each taxed differently. Income earned from selling products and services to U.S. customers would be considered subpart F income and taxed accordingly (i.e., as it is earned at the full U.S. tax rate). Other foreign income would be taxed with a 40 percent deduction (essentially at a tax rate that is 60 percent of the U.S. rate) if it is active foreign market income and with no deduction if it is not active income (taxed at the full U.S. corporate tax rate). The foreign tax credit is retained for the foreign income that is included in taxable income. Both options add to the complexity of the corporate income tax by taxing different categories of income at essentially different tax rates. The plans retain the two provisions contributing to the complexity of the corporate tax: the foreign tax credit and subpart F. Since foreign-source income is taxed more lightly than domestic income, the tax incentives to shift profits and investments overseas is not eliminated. Wholesale tax reform is unlikely this year or in the next Congress. But many of the problems with taxing multinational corporations could be addressed without sweeping tax reform. The tax system could be shifted closer to a pure worldwide system simply by eliminating the largest corporate tax expenditure: deferral. The incentive to shift profits and invest overseas is eliminated. Firms would no longer base investment decisions on the tax implications of those decisions. And corporate income tax revenue could increase by over $50 billion per year, or $500 billion over 10 years. Furthermore, with all foreign-source income taxed as it is earned, subpart F and all of its associated headaches could be eliminated, thus somewhat simplifying the tax code.23 Of course, the foreign tax credit (and associated headaches) would remain to avoid double taxation of foreign-source income, but it too could be simplified and strengthened to reduce cross-crediting issues. Some have argued that foreign-source income should not be taxed by the U.S. because it is not earned here and does not benefit from government actions and protections. However, the Supreme Court got it right in 1924—U.S. citizens and their property benefit from the U.S. government. Many goods produced and sold by U.S. subsidiaries were developed in the U.S. with the help of various tax breaks for R&D (think of the many Apple Inc. products, such as iPhones and iPads). Many of the “foreign” assets (tangible and intangible) are protected by U.S. patent, copyright, and trademark laws. It is often argued that our tax system is broken beyond repair, especially with regard to multinational corporations. Some claim that our worldwide approach to taxing the income of multinational corporations leads to the offshoring of profits and jobs, and that we must exchange the worldwide approach for the territorial approach. This claim, however, ignores one key fact: The problem is not the worldwide approach, the problem is deferral. Deferral allows multinational firms to postpone paying U.S. tax on foreign-source income until it is brought back or repatriated to the U.S. If this income remains offshore indefinitely, then the firms indefinitely escape paying U.S. taxes. Deferral provides multinational corporations a large incentive to move profits, investment, and jobs offshore. Although a variety of very different reforms have been proposed to change how the United States taxes U.S. multinational corporations, none of the major proposals in the 113th Congress gets to the heart of the problem: deferral. Simply eliminating deferral and taking a pure worldwide approach could remove the incentives to shift profits, investment, and jobs overseas. In addition, eliminating deferral would broaden the tax base and raise much needed tax revenue—revenue that could be used for education funding, infrastructure improvements, and other investments in America’s future. Thomas L. Hungerford joined the Economic Policy Institute in 2013 as a senior economist and is also director of tax and budget policy. Prior to joining EPI, Hungerford worked at the General Accounting Office, the Office of Management and Budget, the Social Security Administration, and the Congressional Research Service. He has published research articles in journals such as the Review of Economics and Statistics, Journal of International Economics, Journal of Human Resources, Journal of Urban Economics, Review of Income and Wealth, Journal of Policy Analysis and Management, Challenge, and Tax Notes. He has taught economics at Wayne State University, American University, and Johns Hopkins University. He has a Ph.D. in economics from the University of Michigan. 2. Gravelle (2012b) argues that if competitiveness is the goal, then why stop at reducing rates—why not actually subsidize the firms to operate in foreign countries. 3. A controlled foreign corporation (CFC) is incorporated in a foreign country, but U.S. shareholders own a majority of its stock. Each U.S. shareholder must own at least 10 percent of the stock. It is not uncommon, however, for a single U.S. corporation to own 100 percent of the stock of the CFC. 4. Active income is income generated from the firm’s management of its business (i.e., active business operations). 5. The Kennedy administration argued that allowing deferral for subsidiaries in less-developed nations would encourage U.S. business investment in those nations. In his 1961 tax message to Congress, President Kennedy recommended “that tax deferral be continued for income from investment in developing economies. The free world has a strong obligation to assist in the development of these economies, and private investment has an important contribution to make” (President’s 1961 Tax Message, p. 7). 6. “Check the box” is an administrative rule that essentially allows multinational corporations to determine for themselves how foreign subsidiaries are taxed. The look-through rule (section 954(c)(6) of the IRC) excludes certain dividends, interest, rents, and royalties that are received by one controlled foreign corporation (i.e., subsidiary) from a related subsidiary. See Sicular (2007) and Levin-McCain memo (2013) for in-depth explanations. 7. The annual extenders package is a bill that extends expired or expiring tax provisions. 8. Tax expenditures are revenue losses that are due to special provisions in the tax code that reduce gross income. 9. There are two other baskets of income that receive special treatment. The first is income from investments in sanctioned countries (countries in which the U.S. has no diplomatic relations and countries that support terrorism); this income is not granted a foreign tax credit. The second is income that is attributed to a specific foreign country by treaty; the foreign tax credit is determined separately for this income. 10. At this time, 2008 is the latest year for which corporate tax data are available. 12. In an interview with the Washington Post, Apple CEO Tim Cook said, “To repatriate cash to the U.S., you need to pay 35 percent of that cash. And that is a very high number. We are not proposing that it be zero…. But I think it has to be reasonable” (Kang 2013). 13. Sullivan (2004) shows that U.S. multinational corporations shifted billions of dollars of profits to tax havens between 1999 and 2002. 14. Sheppard and Sullivan (2009, 295) argue this is the case as firms appear to be shifting more “profits offshore than usual in preparation for another repatriation tax holiday.” Proponents of another repatriation holiday in the Senate tried to attach an amendment to the 2009 stimulus bill for another tax holiday; it was voted down. 15. See, for example, McIntyre, Gardner, and Phillips (2014). 16. With the exception of the period around the federal repatriation holiday. 17. See, for example, West and Varma (2012) and Soleimani (2010). 18. The IRS enforcement budget has been reduced from $5.5 billion in fiscal year 2010 to $5.0 billion for fiscal year 2014. 19. Draft legislation of the Camp plan is available on the House Ways and Means Committee website [http://waysandmeans.house.gov/uploadedfiles/statutory_text_tax_reform_act_of_2014_discussion_draft__022614.pdf]. 20. The proceeds from this transition tax would be transferred to the Highway Trust Fund. 21. The discussion draft can be accessed at http://www.finance.senate.gov/newsroom/chairman/release/?id=f946a9f3-d296-42ad-bae4-bcf451b34b14. 22. The discussion draft does not specify what the U.S. corporate tax rate would be other than to suggest that it would be significantly lower than the current 35 percent rate. 23. But enforcement by the IRS could become a bit more difficult because relevant documents of the CFCs may not be readily available. But this should not be much of a problem since firms already have experience producing documents for taxing subpart F income. 24. This proposal was very similar to one introduced by Senators Wyden and Judd Gregg in the 111th Congress (S. 3018). The proposal can be accessed at http://www.wyden.senate.gov/priorities/wyden-coats-tax-plan. 25. Until 1976, the foreign tax credit was determined separately for each country where income was earned. The Wyden–Coats plan would have reinstituted this method of calculating the foreign tax credit. Brennan, Thomas J. 2010. “What Happens After a Holiday? : Long-Term Effects of the Repatriation Provision of the AJCA.” Northwestern Journal of Law and Social Policy, vol. 5, no. 1, 1–18. Chasan, Emily. 2012. “At Big U.S. Companies, 60% of Cash Sits Offshore: J.P. Morgan.” CFO Journal, Wall Street Journal, May 17. http://blogs.wsj.com/cfo/2012/05/17/at-big-u-s-companies-60-of-cash-sits-offshore-j-p-morgan. Costa, Melissa, and Jennifer Gravelle. 2010. “U.S. Multinationals Business Activity: Effective Tax Rates and Location Decisions.” National Tax Association Proceedings of the 103rd Annual Conference on Taxation, Chicago. Desai, Mihir A., C. Fritz Foley, and James R. Hines. 2007. “Dividend Policy Inside the Multinational Firm.” Financial Management, vol. 36, no. 1, 5–26. Drucker, Jesse. 2010. “Dodging Repatriation Tax Lets U.S. Companies Bring Home Cash.” Bloomberg, December 29. http://www.bloomberg.com/news/2010-12-29/dodging-repatriation-tax-lets-u-s-companies-bring-home-cash.html. Gravelle, Jane G. 2012a. Moving to a Territorial Income Tax: Options and Challenges. Congressional Research Service report R42624. Gravelle, Jane G. 2012b. “Moving to a Territorial Tax: Issues and Design.” Paper presented at the National Tax Association 2012 Annual Conference on Taxation, Providence, R.I.
Gravelle, Jane G. 2013. Tax Havens: International Tax Avoidance and Evasion. Congressional Research Service report R40623. Grubert, Harry. 2012. “Foreign Taxes and the Growing Share of U.S. Multinational Company Income Abroad: Profits, Not Sales, are Being Globalized.” National Tax Journal, vol. 65, 247–281. Hines, James R. 1999. “The Case Against Deferral: A Deferential Reconsideration.” National Tax Journal, vol. 52, no. 3, 385–404. International Monetary Fund (IMF). World Economic Outlook Database. http://www.imf.org/external/pubs/ft/weo/2013/02/weodata/index.aspx. Joint Committee on Taxation (JCT). 2010. Present Law and Background Related to Possible Income Shifting and Transfer Pricing. JCX-37-10. Joint Committee on Taxation (JCT). 2013. Estimates of Federal Tax Expenditures For Fiscal Years 2012-2017, JCS-1-13. Kang, Cecilia. 2013. “Apple CEO Tim Cook to Propose Tax Overhaul.” Washington Post, May 16. Krull, Linda K. 2004. “Permanently Reinvested Foreign Earnings, Taxes, and Earnings Management.” The Accounting Review, vol. 79, no. 3, 745–767. Levin, Carl, and John McCain. 2013. Offshore Profit Shifting and the U.S. Tax Code – Part 2 (Apple Inc.). Memorandum to Members of the Permanent Subcommittee on Investigations, May 21. Linebaugh, Kate. 2013. “Firms Keep Stockpiles of ‘Foreign’ Cash in U.S.” Wall Street Journal, January 22. http://online.wsj.com/news/articles/SB10001424127887323301104578255664471212. McIntyre, Robert S., Matthew Gardner, and Richard Phillips. 2014. “The Sorry State of Corporate Taxes.” Citizens for Tax Justice, February. http://www.ctj.org/corporatetaxdodgers/. Murphy, Maxwell. 2013. “Indefinitely Reinvested Foreign Earnings on the Rise.” CFO Journal, Wall Street Journal, May 7. http://blogs.wsj.com/cfo/2013/05/07/indefinitely-reinvested-foreign-earnings-on-the-rise/. Sheppard, Lee A., and Martin A. Sullivan. 2009. “Multinationals Accumulate to Repatriate.” Tax Notes, vol. 122, no. 3, 295–298. Shoup, Carl S. 1974. “Taxation of Multinational Corporations.” In The Impact of Multinational Corporations on Development and on International Relations, Technical Papers: Taxation, ST/ESA/11, New York: United Nations. Sicular, David. R. 2007. “The New Look-Through Rule: W(h)ither Subpart F?” Tax Notes, vol. 115, no. 4, 349–378. Soleimani, Daniel. 2010. “The Difficulties with the Subpart F System of International Taxation: How the Schering-Plough Decision Indicates that the Status Quo is Unclear and Unwise.” Emory Law Journal, vol. 60, 503–535. Sullivan, Martin A. 2004. “Data Show Dramatic Shift of Profits to Tax Havens.” Tax Notes, vol. 104, no. 12, 1190–1200. Van Dijk, Michiel, Francis Weyzig, and Richard Murphy. 2006. The Netherlands: A Tax Haven? Amsterdam: Centre for Research on Multinational Corporations. West, Philip R., and Amanda P. Varma. 2012. “The Past and Future of the Foreign Tax Credit.” Taxes, March, 27–47. Zion, David, Amit Varshney, and Nichole Burnap. 2011. “Parking Earnings Overseas,” Credit Suisse Equity Research.